Being of the age where retirement and other pursuits began to offset the desire and need to work we decided to move from Brisbane to Noosa. Having been a boatie for over 20 years, a significant part of the plan was a new boat. Apart from being a premier tourist destination the Noosa area is also known for great fishing, both on the river and on the many offshore reefs most of which are close by. Unfortunately, the Noosa Bar is very shallow and has the reputation of being one of the most difficult on the Australian east coast with many regular incidents. It was well known for being deceptively flat in the morning and being challenging when the afternoon sea breeze came up, particularly on an ebb tide. We needed a very flexible and capable boat. Our plans also include taking in other great fishing locations on the Sunshine Coast and further a field. My last boat was a beautiful 6.5m glass boat which, while a dream to drive was very heavy to tow and very fuel hungry with its large two-stroke outboard. It always needed two people for launching and retrieval. While it was a large cuddy and classified as a ‘sports pursuit’ fishing boat, fishing with more than two people was a bit tight. Anyway, we couldn’t store it at our house at Noosa so it had to go. My requirements were becoming fairly well obvious: I needed a boat which could be used to fish easily in sheltered estuary conditions, could cross a tricky bar (ask the Coast Guard) and run out comfortably to the relatively close offshore reefs on a good day, but could handle the rough stuff if necessary. We also wanted plenty of room, ease of handling and something not too heavy to tow reasonable distances. I realised that an aluminium centre console / walk around boat was the best option. Having once owned a pressed tinnie from one of the major manufacturers I knew a plate aluminium boat was my only real option. Thus began my regular attendance at boat shows and boat yards, reading boating magazines, researching the web and so on. Each time I’d started to warm to a particular boat, something better would come along. I even got distracted by some cuddy cabins, but quickly came back to my original concept. Bar Crusher boats had been on the periphery of my radar for some time, but as the admiral at home had initially set a strict budget limit, they remained a dream. In time having come to most of the boat shows she was beginning to realise that to get what we both wanted (she’s a very keen fisher) the budgetary horizons needed to be expanded. Barely concealing my excitement, (I’m still a big kid at heart), we rushed over to look at the boat. There was nothing that we’d need to add to the package presented to us apart from the GPS/plotter. One problem, our house sale wasn’t finalised and we had a trip to Europe, meaning I didn’t have the cash on hand. Never mind, the Brisbane Boat Show would happen a week after we got back and we knew we’d still get some very competitive pricing if we waited. The trip was great, but I wanted that boat. Two days after we got back I went in and did the deal. Luckily I was able to get a display boat off the floor meaning I’d get it just after we’d moved to Noosa. Early in September I came back to pick up the boat. The next day with a boatie mate we put it on to the Noosa River. Handling and retrieval was everything I wanted, but something was missing. After installing a Solas stainless prop I had a really magnificent boat – to my mind better than my beloved glass cuddy. I’ve only crossed the Noosa Bar once on a dream calm day. While our fishing expedition was unsuccessful, we did see several groups of humpback whales, one of which came fairly close with her calf. She then proceeded to put on a display tourists pay hundreds of dollars for. With a plan to do some travelling with the boat I made one change to my on-road rig, I upgraded the trailer to a tandem – more for my peace of mind rather than of necessity. With the trailer frame the same it was a relatively simple procedure for anyone mechanically minded. Having moved into my new house we haven’t hit the water as often as we’d like, but some of the work has included a storage area for the boat so we haven’t begrudged not going out – yet. 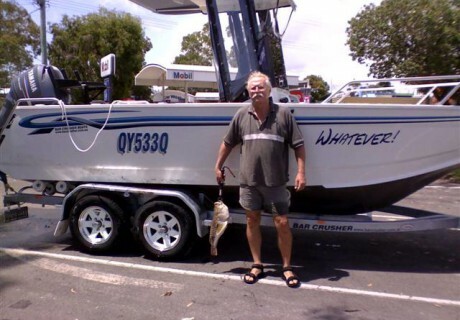 Knowledgeable fishermen have been catching monster flathead near the Noosa River mouth and while trying to do the same I landed a stargazer – my wife thought I had a snag but I proved her wrong. It was a challenging fish to fillet but was beautiful when slowly cooked in the oven later that day. We love the boat and look forward to putting it to good use over Christmas and in the New Year when the mackerel and tuna begin their runs. I look forward to some good catches out there – as well as some of those elusive lizards. We get many admiring and envious comments about the rig – even from some German tourists who had never seen a trailer boat, or realised how easy it was to retrieve.